When it comes to fabulous vacation memories and a setting where the ocean rules the scene, it’s hard to beat the lovely Life of Reily. 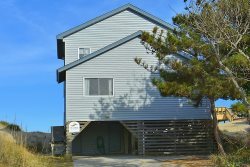 Located at milepost 4.75 in the heart of the Outer Banks, Life of Reilly is close to great local restaurants, shopping, and family attractions. Life of Reilly is situated on a quiet street located one street back from the beach road and has easy access to the beach through a private neighborhood path. The front of the house and decks face the ocean. Distance to the beach is approximately 500 ft .
Life of Reilly is the perfect beach getaway and has everything you need for a great family vacation. Enjoy the ocean views from the decks while sipping your morning coffee or evening beverage. Enjoy cooking in the fully-stocked kitchen or out on the charcoal grill, with plenty of seating for the entire family. A second refrigerator is in the garage for your convenience. The main-level "open" floor plan includes a very bright and sunny living room with cathedral ceilings, sunroom, dining room and kitchen. The 3 ceiling fans will keep you cool which watching your favorite shows on the large flat-screen TV with DVD. The master bedroom is also located on the main-level which includes a King size bed, TV, a separate sitting room with two gliding/rocking chairs and ottomans and a full bath. Down the hall is a powder room, small office with desk and phone, and a large laundry room with top-of-the-line Washer and Dryer, a sink, storage, and a door to the back deck. The upper-level has 3 beautifully decorated bedrooms: a King bedroom with cathedral ceiling and sliding doors to a furnished deck with ocean views; a Queen-size room, and a room with 2 Twins. All rooms are "beachy" in decor and have their own TV (one with DVD), and ceiling fan. The full bath with tub is located in the hall right outside of each bedroom door. The lower level of the cottage gas a 2-car garage, but is now set up as a gaming area with a refrigerator, washer and dryer, TV, radio, corn hole and sitting area furniture. This area is not cooled/heated. There is a basketball net at the end of the driveway and with the 2 garage doors raised, this is a perfect hangout for some family game time fun. There is also a large outdoor shower. When it comes to vacation retreats, Life of Reilly easily hits all the high notes, and will inspire beach fans to return year after year for more. Please come and enjoy the beauty and solitude of the Life of Reilly!